OMP's cotton apron for mechanics. 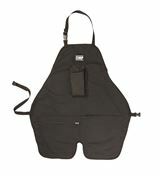 This apron features a small tool pocket and larger general pockets. Available in black or red.